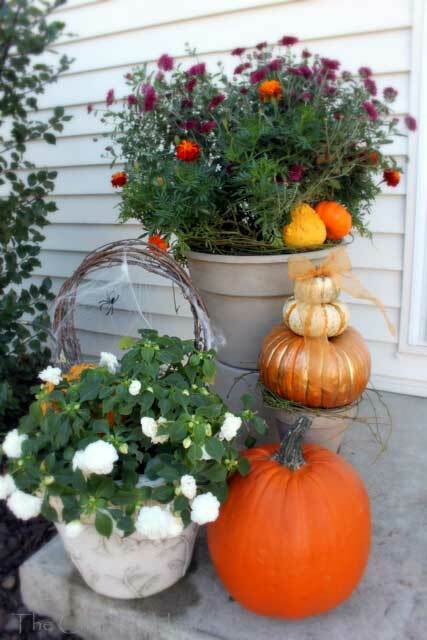 Decorative pumpkins make splendid fall decorations. 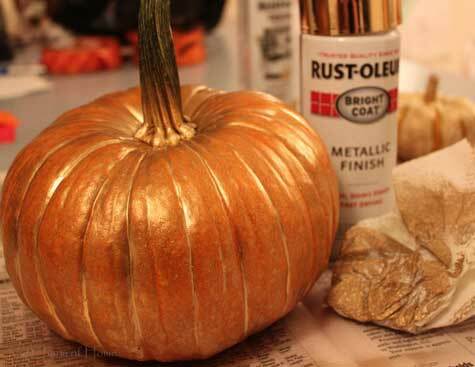 Sherry shares with us how to make gilded pumpkin decorations and how to display them as well. 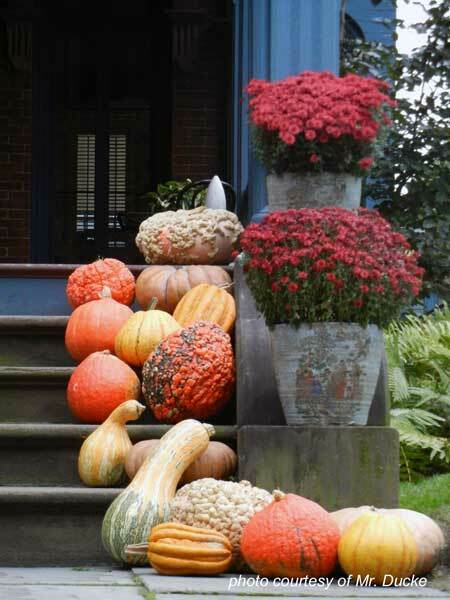 Our fall decorating ideas section contains many ideas for using pumpkins and autumn gourds on your porch. We begin with a picture of Kim's pretty pumpkin arrangement and then Sherry's lovely gilded pumpkins and fall porch decorations. 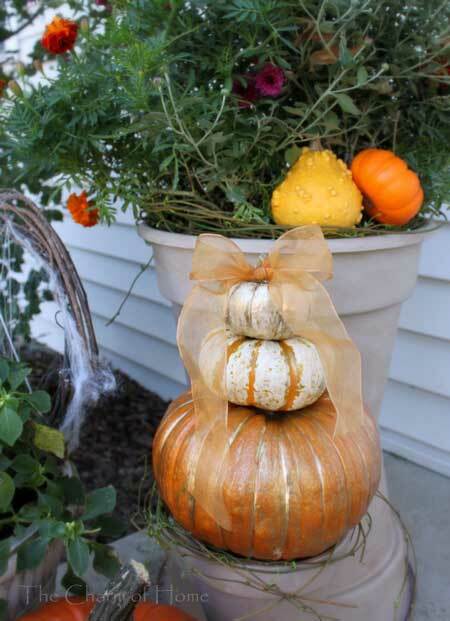 Sherry, author of The Charm of Home, shows us how to create a wonderful porch arrangement using pumpkins, pots, and flowers. 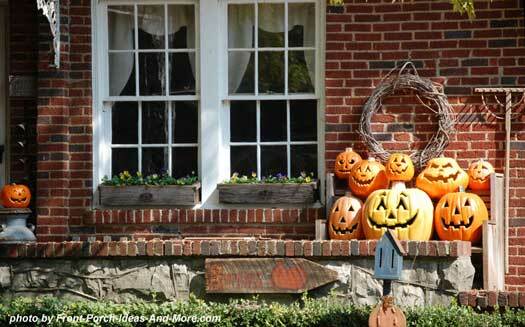 Sherry's ideas also work well for a decorated Halloween front porch too. Sherry's arrangement works beautifully on her porch. 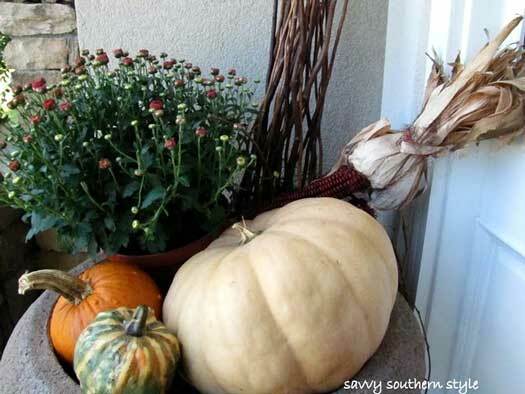 She uses simple pots, wreaths, and creativity to create a wonderful autumn display. 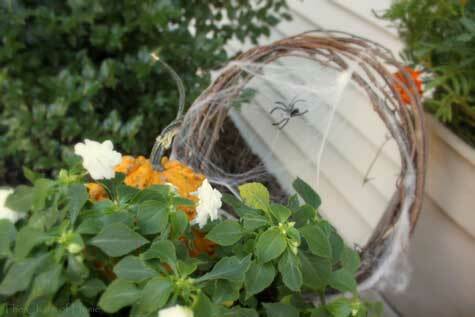 Note how she placed a wreath in a flower pot and added a spider web and a friendly spider! That is so cute. 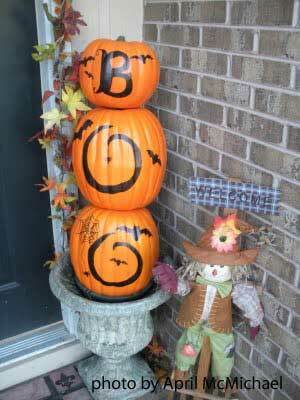 Sherry writes that she had been wanting to make a pumpkin topiary so decided to try one for her porch. Here's how she put it all together. Sherry's first step is to create an urn on which to place the topiary. Instead of purchasing an urn, she decided to make her own with materials she already had. She painted two terra cotta pots with a textured spray paint and then aged it glazing. She then hot glued them together, one on top of the other. 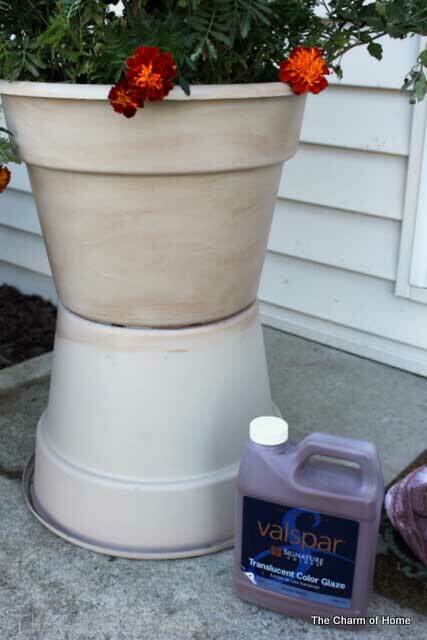 Sherry repeated the process to make this large urn which were free planters from her family. She spray painted and glazed them so they looked more like stone. Because they were so large she drilled holes in the bottoms and secured them with nuts and bolts. 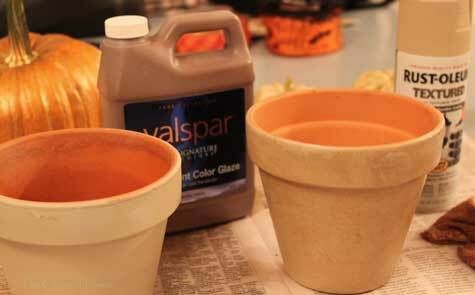 In the photo below, Sherry is in the process of glazing the pots with Valspar glaze in mocha. 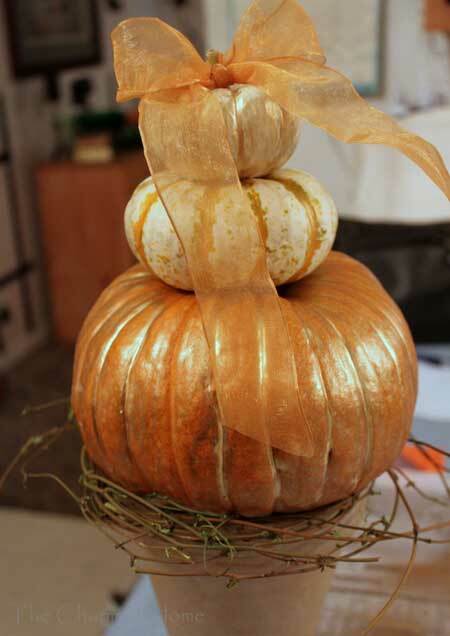 Sherry really wanted to gild her pumpkins in gold and came up with an easy way to do it. 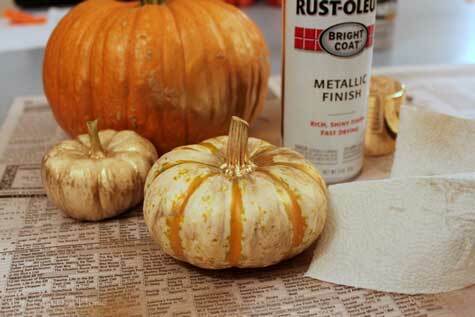 Spray the pumpkin with gold spray paint and wipe it off quickly with a paper towel. It worked great. To make the topiary Sherry used bamboo skewers from the grocery store. 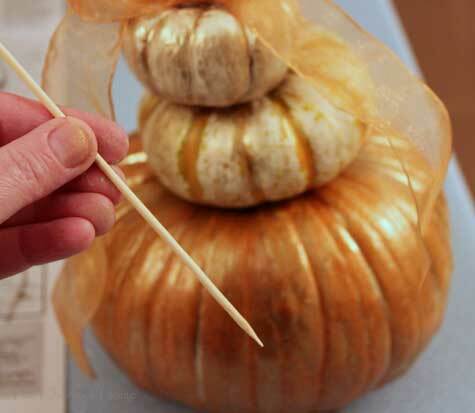 If using larger pumpkins, dowel rods may work better. 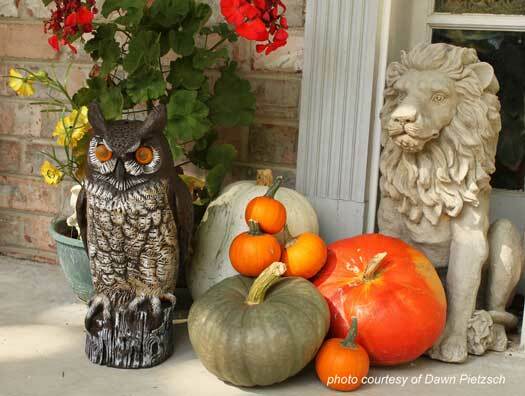 We really appreciate Sherry sharing her porch decorating and gilded pumpkin ideas with us; please visit her wonderful recipes on Pinterest. 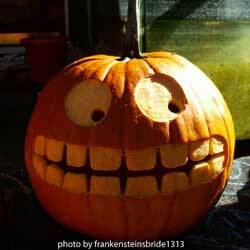 Use our photos below to pick out ideas you can use this year to create your own decorated pumpkins and displays. 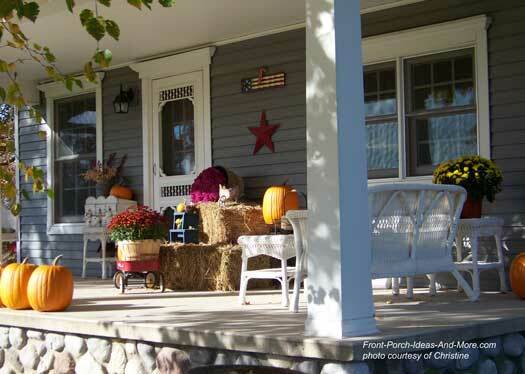 Pumpkins almost always makes an autumn porch more inviting. 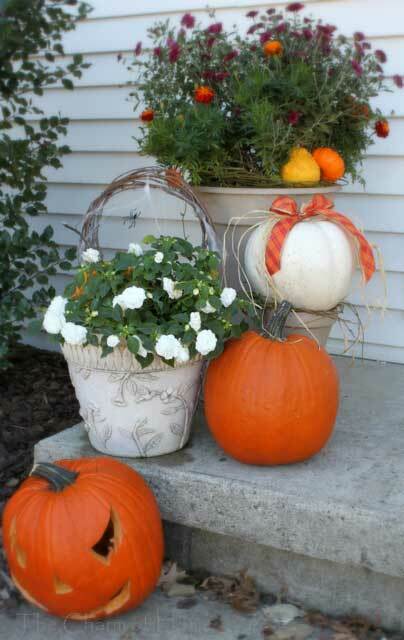 Integrate pumpkins with other front porch decorations.